Shure's SE530 Sound Isolating Earphones With PTH Option. 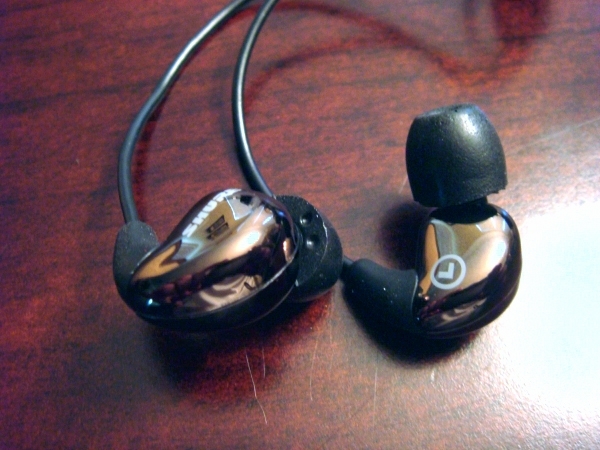 Price: SE530 In-Ear Sound Isolating Headphones: $549.00 USD with the PTH option; $499.00 USD without the PTH option. System Requirements: Windows Phone or other PMP and a good ear for music. Fits flush within the ear making them very discrete. The PTH cabling and the ear buds themselves do not fit completely inside the carrying case. If you listen to music or watch any type of multimedia, these headphones will surely delight you; that is, if you have properly ripped your music and converted your DVDs to a bitrate that is worthy of these ear buds. I personally have a set of Shure's SE530's (yes, I paid for them); but, I use my Windows Phone extensively for music and multimedia. I was excited when the good people at Shure allowed me to test their PTH option. Music is one of the necessities of my life and in my quest I have had many headsets, ear buds, etc. in the past. Aside from having a personal mold made of my ear and sending it to have it fit "perfectly," I have never found a more perfect pair of noise reduction, in-ear set of headphones that make you look like a normal human being instead of a techno DJ with cans on your head. Custom molds can cost in upwards of $1,000 USD or more and although I've always considered it, (stay with me for another review) I've never seen, nor heard, such aural nirvana before as with the SE530s from Shure. In this review it's only fitting to compare the two separate as they can come either together as a kit, or separate, it would not be fair to couple them together. Keep reading to see why. Figure 1: To the left, the aluminum metal box which the headphones, accessories and hard shell casing comes in. Instruction booklet to the right. 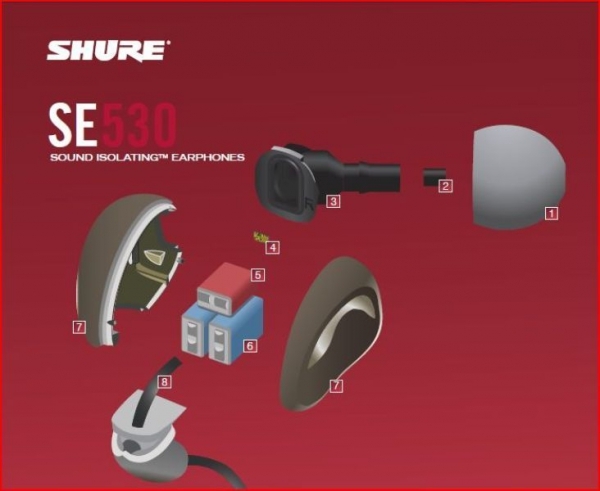 These are the Shure SE530 Sound Isolating Headphones. 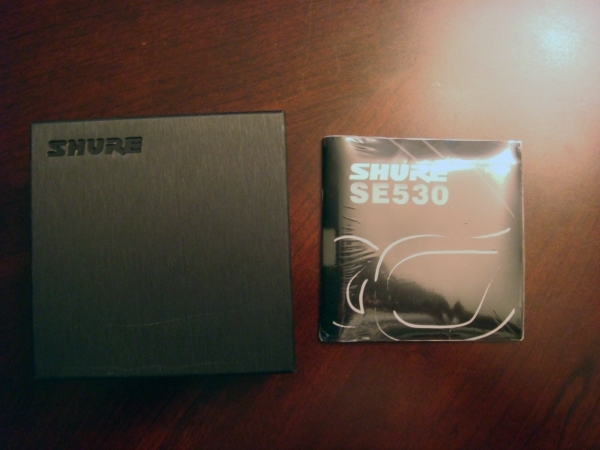 First, you will be greeted with an aluminum box (classy) with the Shure branding. Just looking at the box, you know you're about to embark on a treat and the price tag seems to slowly sting a little less. Once opened, you'll see them - the shiny metallic bronze starring at you and begging to be picked up. They're tightly wrapped in foam and the connector is gold plated. Once they're removed from the aluminum vault that they came stored in, you'll see the nice hard shell casing - again with the Shure branding. Inside the case is where you'll be greeted with an array of cables, accessories, and ear buds of all shapes, textures and sizes. The ear buds that will probably catch your eye first are the soft, black, memory foam shaped tips. You'll receive in the case the following, all with gold plated connectors: Modular cable (3 feet in length), 1/4" adapter, a Level Attenuator (more on this later), a wax removal tool (hey, it's a necessity), and finally an airline adapter (only useful on European airliners). All of this, plus the earphones themselves, will fit nicely into the carrying case. You have a choice of several tips ranging from silicone, soft rubber, and memory foam as stated earlier; surely one is bound to meet your liking. Figure 3: Diagram of the build of each headphone. That's very impressive for earphones this small. The quality and construction are solid with nice thick cabling and gold adapters. Like I mentioned earlier, I listen to music and multimedia extensively and my taste in music is broad and eclectic so I run the gambit of frequencies. 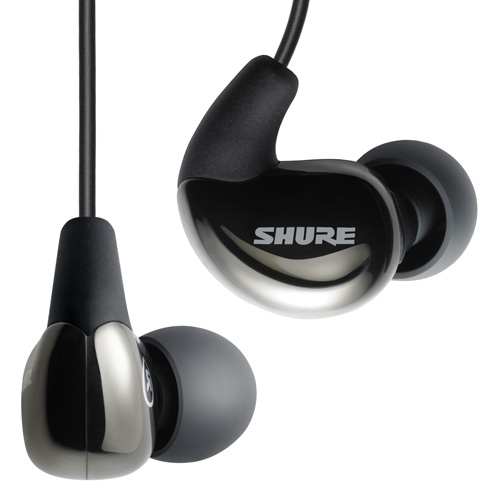 The Shure SE530s produce crisp highs, warm mids and deep bass that is not overbearing. If you're listening to classical music you'll pick up on every instrument - from an oboe to the French horn - with clarity. If you listen to country, you'll notice the twang in each banjo strum and the pedal steel guitar will sound perfect with every pitch. Finally, if you enjoy R&B or any other type of music, the sub-woofers will not overwhelm the lyrics that come to the table with each song. Performance and build are strong keys for me since I sleep with mine every single night to help promote sleep. The headphones fit flush in the bowl of the ear and inside the external canal. This is important because when sleeping on your side you do not want a pair of headphones to further protrude into your canal posing possible damage to your ear. These can be worn for 12 hours at a time or longer without any pain (using the memory foam tips). Just please be careful to keep the level of your audio low or you will eventually cause deafness. "Triple TruAcoustic MicroSpeakers Optimized for listening to high-quality recordings and lossless formats, the SE530PTH utilizes three balanced armature drivers—one dedicated tweeter and dual woofers. Additionally, integrated passive crossovers ensure that high and low frequencies remain distinct and defined. The result is an incredibly wide and detailed soundstage, distinguished by precision highs and robust bass. This innovative triple driver configuration is first in class for universal fit, sound isolating earphones." 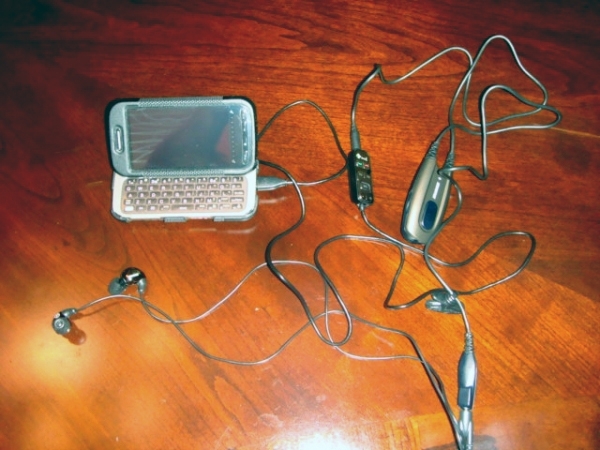 Figure 4: Note the headphones connected to the PTH accessory which is then attached to the HTC in-line USB adapter. 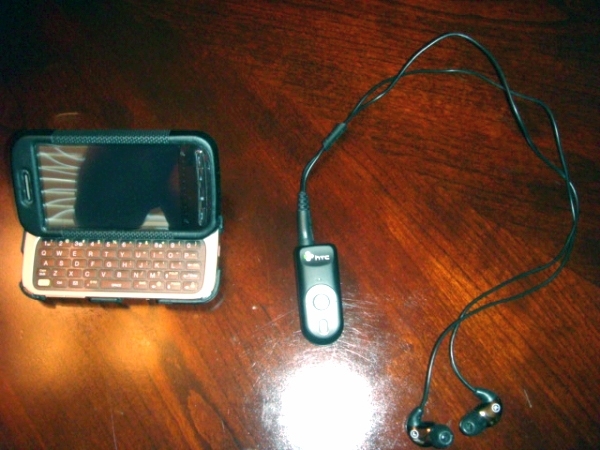 Figure 5: The HTC BH S100 which can accept and receive phone calls, is Bluetooth 2.0 Stereo compatiable, and can clip to your clothing. It also has play, pause, forward and backward controls for HTC Sense and Windows Media Player. 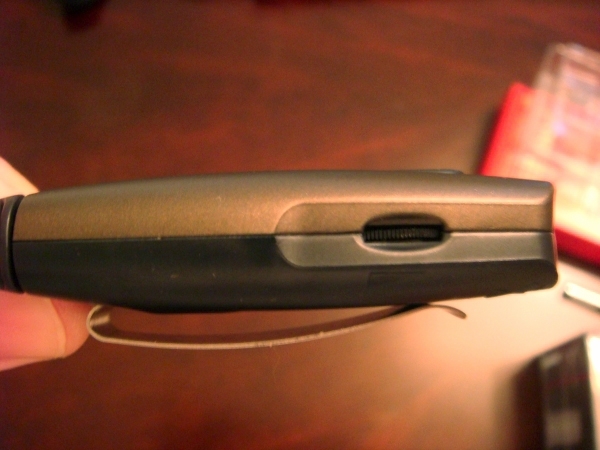 Figure 6: The volume slider on the PTH accessory is too flush or depressed into the main body, making it difficult to adjust the volume. There is a clip on the back of the main body of the accessory to attach to your belt, waistband, or other piece of clothing, but again, there is just too much cabling to justify the clip. Also, there is another clip that can be attached to your shirt to hold the other cable in place as it makes it way to your ear, but again, this negates the purpose. All in all, when it comes to the bottom line, it's all about the massive design, overuse of cabling and poor design overall that sends this accessory to the very bottom of my list and I'm grateful it's an option that you're not forced to pay for. Other designers have streamlined their PTH buttons inline within the headphones themselves which makes it more convenient and makes a lot more sense. It's also included in the price and not an extra expense. They are true PTH's where it's a button and not a slider and does not use a battery, which itself is an extra expense and an unnecessary expenditure - which brings me to this little nugget. The SE530s have a Level Attenuator that comes WITH the headphones themselves - remember, from the beginning of this article? If you need to adjust the volume to hear someone you can easily lower the volume and hear them partially or just remove a ear bud and hear them with clarity and that right there my friends does not cost a dime, nor does it add bulk. While I already knew the headphones would sound wonderful as I already owned a pair, I was very excited to try out the PTH option. The headphones, of course, did not dissapoint, but the PTH accessory was an "epic failure." So, to sum I would have to say that the headphones are phenomenal and worth the money if you have it to splurge. I would forego the PTH accessory and instead just take your ear bud out and ask, "What did you say?" Monty Gibson is a Registered Nurse in Tampa, Florida, U.S.A. and is always on the lookout for the next best pair of headsets that won't entrap him while sleeping at night, but at the same time wants a symphony in his ear. I'm insanely jealous. I own a pair of SE210s that I absolutely love but I can't even begin to imagine what the SE530s sound like in comparison. But the price tag on the SE210s was a bit higher than I was expecting to go at the time and I don't think I could bring myself to part with $500 for earphones. I do know one thing though...Shure has a satisfied customer here. Its a shame about the PTH though. I've considered buying it since I figured it might be useful since the sound isolation is so good. But doesn't sound so hot to me. does using a BT adapter violate audiophile policy? I do like the PTH idea. The slider thing sounds annoying though. I have UE's Triple.Fi 10vi, which I got from Amazon for US$99, and you know what? I can't ever imagine paying US$300+ for it. It's good, but not *that* good. Make sure to keep your receipt! There is a two year guarantee on these buds, and I had to use mine. Right bud just went dead. After paying that much money for the 530s, to say I was disappointed would be an understatement. If you use headphones to work out with, I would suggest using a cheaper pair and save these for more sedate times. The cord material just does not stand up well to the rigors or working out. I actually own three pair: The SE210, SE310, and of course my SE530's. The 210's are my daughters for her Zune, the 310's for my wife's Zune and mine are for my Touch Pro 2. They use their's mainly for working out and the do extend out of their ears a little bit, making them uncomfortable for sleep. Mine fit flush in the ear, unlike the others, and when sleeping it's very comfortable. You can definitely tell a difference in the mid's and bass response further up the ladder you go. If you did part with that $500.00 I'm sure you won't be dissapointed. I'm not trying to promote you to go in debt, but if you get the chance (in this economy) give it a shot. I'm very satisfied with Shure. Like I stated, foregoe the PTH option; however, for now, until they redesign it. Yes, very true. However, mine are out of warranty by the time I need the warranty. As I've stated, I sleep with mine and the wear and tear I put on mine are usually out of the norm for most everyday causual users. Tossing and turning puts a strain on the cables and the wires. Not to mention the pressure being applied to the internal components. But, I'm happy with them and usually just send them in to get fixed. It's a nominal fee and they come back brand new. Um, to tell you the truth, at night I use the BT option to cut down on wires and there really isn't *that* much difference; there is of course, but not much; however, during the day I hardwire my headset and it clears up any hiss that may be present. Good idea, bad design and execution. I'm sure that they will come out with an easier inline slider option or a true push button later down the road. I can honestly tell you that the $500.00 that I spent on these headphones are *that* good. I can't live without them. But, to each his own, you have to have a taste for it. Oh, I have no doubt that they are worth every penny. Just the thought of all those drivers in there make my head spin. I easily listen to 4 - 8 hours of music on them every day at work. So it wouldn't be a horrible investment But until I wear out these SE210s I can't bring myself to do it.